Mind you, they cannot be loose muumuus that I will fit into anytime, they have to fit my form well at every stage of development: Accommodate and Flatter. 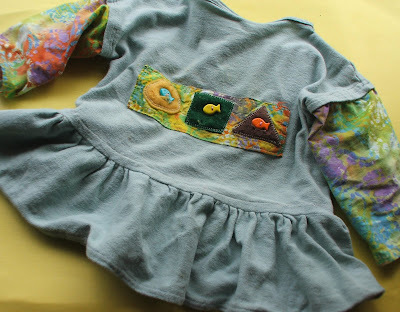 Anyway, a while back, I had sewn this sage pique knit tee for my wee tot, with batik sleeves and all, a fairly nice-looking appliqué to boot... I liked the way it fit her. I liked the way she looked in it. Now, a few months down the road, the same shirt bares her midriff. Not the sort of look I want a not-yet-two-year-old to sport. It is a good thing I save the scraps after each sewing project. I had enough to add a few inches of frilled extension to the shirt and prolong its wearability for a few more months.